Digital Camera Test Lighting - HMIs! New, laboratory-grade lighting at Imaging Resource! Along with the changes in basic review format and the addition of two new/modified test targets that were mentioned in other articles, we've also made a fairly major change in the lighting in our studio. From the inception of the site, we've used a dichroic-filtered, gel-diffused incandescent lighting setup, built around SoLux bulbs, developed by Tailored Lighting. These lights were an excellent solution for our shooting needs, as they produced a spectrum very close to "standard" daylight when operated at 16 volts, and the setup (using self-constructed mounts and transformer assemblies) was relatively affordable. The downsides of our original light setup were that changing bulbs and re-balancing the illumination was a tedious, painful process, and the diffusion gels we had to use to achieve even illumination with them introduced a slight color shift toward warmer tones. Back when I was first setting up the site, one lighting technology I considered was HMI (Hydrargyrum Medium-arc Iodide) fixtures and bulbs, widely used in the television and movie industries to simulate daylight, or to provide daylight-balanced fill lighting outdoors. I initially rejected HMIs for two reasons: First, they were insanely expensive, at least relative to the non-existent budget I had to launch the site. Secondly, I was concerned that a number of narrow emission spikes in their color spectrum could produce metamerism with our test subjects. For these reasons, I chose to go with dichroic-filtered incandescent lamps as our "daylight" lighting solution. A while back though, while touring Fujifilm's R&D labs, I discovered that they used HMIs for daylight simulation, and were quite happy with the color spectrum the lamps produced. A little further research revealed that most, if not all camera makers rely on HMIs for their simulated daylight. It appears that the emission spikes I was worried about are sufficiently narrow that they don't cause metameric problems with the vast majority of naturally-occurring subjects, and the color spectrum otherwise is an excellent match for natural daylight. While I was still deterred by the high cost, the improved color spectrum of the HMIs over our then-current filtered incandescent lighting led me to begin saving pennies (well, more like hundreds of dollars) and to search for the best deal on professional-grade HMI lighting equipment. 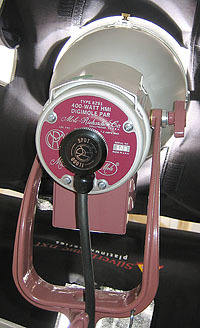 What I found was that the HMI store has no such thing as a bargain basement: To achieve proper intensity and color control, HMI lamps require a fairly complex electronic ballast, driving up the price considerably. Demand is also largely limited to the movie and TV industries, so there's no mass market out there to pull the prices down. After some searching, I did find what appeared to be one of the best deals on the market, the Digi-Mole 400 units by Mole-Richardson. These are great little lights, and seemed to offer more bang for the buck than anything else I came across. They're still by no means cheap, but were less expensive than anything else I came across, and offered nice features as well. 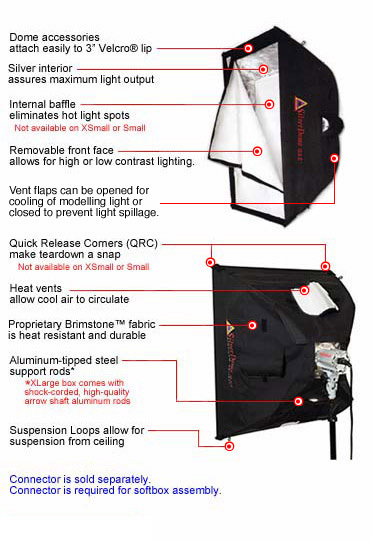 While we at this point use them exclusively inside softboxes (Photoflex SilverDome NXTs), they have parabolic reflectors, with a nifty knob-operated mechanism that lets you "zoom" their beam from a tight spot to a pretty broad area light. They're reasonably lightweight (for HMIs), and have quite compact ballast units that can sit comfortably (and quietly -- no fans) on the floor at the end of a long cord. The shot above shows the new light setup in our test lab, with a total of four Digi-Moles mounted in four medium SilverDomes, supported by four Manfrotto wall booms. The combination gives us a wash of true ~5500K daylight, balanced to within 0.1EV across our entire target area. 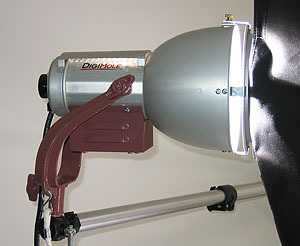 The shot above shows the body of one of the Mole-Richardson Digi-Mole 400 light heads, mounted on a wall boom. The head is mounted to the softbox via a speedring, a cast aluminum disk with a flange on it that slips into four clips mounted around the periphery of the reflector. The support rods for the softbox fit into four sockets on the ring, placing them under tension to hold the box open. The flange around the speedring lets you rotate the softbox to any angle without moving the light head, and the whole thing can be quickly lifted off by loosening a thumbscrew on the top of the reflector and moving the retainer tab underneath out of the way. Here's the back end of a Digi-Mole head, showing the knob that moves the lamp socket in and out, to vary the width of the beam coming from the light head. Finally the shot above shows a pair of the Digi-Mole ballasts, powering half of the light setup shown above. 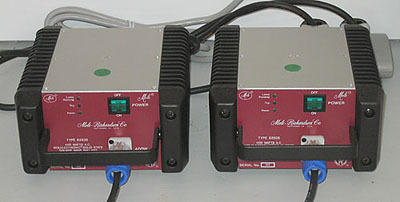 They're pretty darn compact, much smaller than ballasts on other HMI units I've used on occasion in the past. They're cooled via the large black cooling fins on either side, so you need to provide some clearance around the units. (In fact, I think I ought to move the two of them apart a bit further than they're shown here, so the air can circulate better.) You also probably don't want to stack them on top of each other, although their design strongly suggests that as a space-saving measure. They run quite warm (but not hot) to the touch, but are very quiet because they have no fans. There is a slight "singing" sound in the studio from the HMI arcs themselves, but it's not annoying, even for a confessed noise-phobic like myself. As you might gather, this is a pretty dramatic equipment upgrade for the IR test lab, one that we feel really puts at least the lighting of our lab on a par with that of the camera manufacturers themselves. It also creates a dividing line of sorts in our camera testing, as from this point forward, we'll be using this light source in place of the one that we began with, now over eight years ago. We're sure that our readers will have a lot of questions about this change. We've tried to anticipate as many of them as we could in the FAQ list below. If others turn up, we'll add them and their answers to this list. Q: Doesn't this create a problem in comparing new cameras shot with these lights to previous ones shot with the previous filtered incandescents? A: Yes and no. From a color standpoint, yes, but in terms of resolution, image noise (to the first order of approximation), and tonal balance, no. This wasn't a decision we made lightly, but felt that the loss of some backward compatibility in terms of color balance was more than worth it, compared to the improved color balance, and closer match between our test conditions and those of the digital camera industry as a whole. Q: How many cameras shot with the new lights will be available for comparison from the get-go? A: As of this writing (May 20, 2006) we're still playing catchup with shooting the backlog of cameras currently in-house with the new lights and the new "Multi" and Still Life test targets. We should have these all caught up in the next week or so, and another week or two past that should see these new targets added to our Comparometer for all the cameras we've shot with. When that's accomplished, we should have samples of the new targets available for no less than 55 different cameras, including a majority of the models announced in 2006. Q: How can we tell which shots were taken with the new lights and which with the old? Q: What do you mean by "to the first order of approximation" when talking about image noise comparison? A: Image noise is to some extent dependent on the color balance of the light source a camera is being tested under. Or, more accurately, on the match between the color balance of the light source and the native white balance of the device under test. 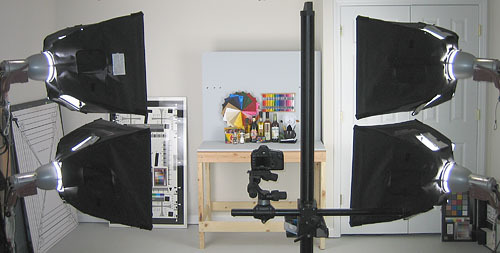 Most digital cameras are designed to have a "neutral" white balance under normal daylight lighting, at a color temperature of roughly 5500 Kelvin. When shooting under warmer-toned lighting, the camera has to increase the gain of its blue channel (and to a lesser extent, sometimes of its green channel as well) to achieve a neutral color balance. Boosting the gain of the blue channel also boosts its noise, so warmer-toned light sources tend to make for noisier images, at least in the case of the camera's white balance being adjusted to produce neutral balance in the final images. Because our previous light source was a few hundred degrees K warmer than the new HMIs, noise levels of older cameras will appear slightly elevated relative to those shot under the newer source. The difference should be slight, because the color temperatures aren't all that different between the two sets of lights, but we mention it for the sake of accuracy and completeness. Q: What measures are you taking to insure that color temperature is held constant? A: This is an important issue that we're paying close attention to with these new lights. The lights themselves produce an excellent "daylight" color spectrum, but do show a shift of about 1 degree Kelvin for every hour of operation. We've found that there can also be minor differences of 100-200 K between different bulbs, even of the same model from the same manufacturer. (We use Philips globes in our DigiMoles.) Accordingly, we micro-gelled the individual lights to arrive at a uniform color temperature of 5500K between all four of them and will be checking them biweekly to insure that the color temperature stays within 100K of the 5500K standard. We'll adjust the gelling as needed to maintain that tolerance. Q: What do you mean by "micro-gelled?" A: That's our term for a way that we found let us make very small adjustments to the lights' color temperature. Fine-tuning the color balance of the lights, we found that even the lightest conventional color-balancing gels produced color shifts of a minimum of several hundred K. To achieve minute adjustments, we found it very effective to tack swatches of gel material to the highly reflective interior of the soft boxes. By subtly changing the color of the light bouncing around the inside of a soft box, we could easily make very minute changes in the color of the light coming out the face of it. This took a fair bit of patience, as we had to open up the soft box every time we made a minor tweak, then close it back up again to measure the resulting color temperature with the color meter. The result though, is that we can achieve almost arbitrary resolution in adjusting the color temperature of our light sources. Q: Do you have any other test changes planned in the near future? A: No more having to do with lighting. We're looking to develop a more advanced "Multi" target, that we hope to have in use by the end of this summer. It will be fully backward-compatible with the current target though, as it'll primarily be adding new test objects. We're also looking to upgrade the House poster to a much higher resolution (> 400 megapixels) one. We'll continue shooting the old current House poster for some time though, to facilitate comparisons of new and older cameras.